When I saw the infamous Burberry Owl sweater on Kate Bosworth (photo) I instantly loved but knew I could never afford it. So when I walked past this sweater at Target a few weeks ago I stopped in my tracks and did a double take and instantly fell in love, then I reluctantly hung it back up. 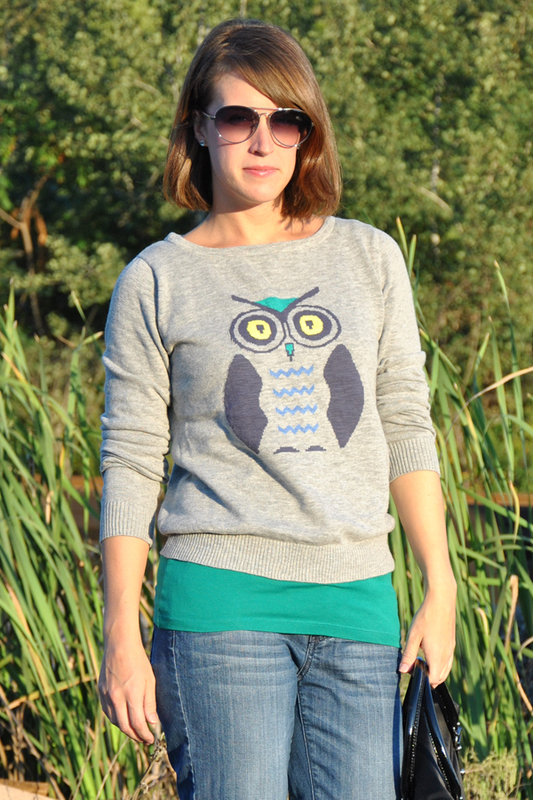 I couldn't wear a sweater with a big owl on it...or could I?? My love for this sweater beat the questions in my head and I'm so glad it did. Not only is it cute but it's so comfortable to wear. It looks a little short in these photos but that's because I had it pulled up so you could see the green tank. I think this sweater could transition from jeans to a skirt with no problem and will be with me for a long time. There are so many animal printed sweaters out this fall which makes me wonder how you feel about the animals sweaters? such an adorable look! in love with your owl shirt! Loving the owl sweater.. Fun!!! I don't usually like printed shirts but this top is so cute! I was thinking about getting it too! Definitely should- Target also has a cute one with a fox on it. I love this outfit, the yellow shoes are perfect! I really like the animal sweaters, I think they are cute and different. Think I saw that cute sweater in Lucky. I'm headed to luckyFABB too! Hope to see you there (in 2 days). ikes!